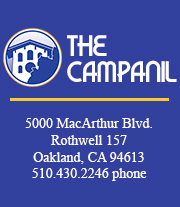 The Campanil newspaper will celebrate its 100th year in publication in the 2016-17 school year. In 1917 the literary magazine, Mills College Magazine, was replaced by Mills College Weekly as the first campus newspaper. According to the 1919 Mills College yearbook, The Chimes, out of the rapid growth and development on campus, there was a great need for a new publication that would discuss the different parts of the campus life. The publication went through other names, such as the Mills Stream in 1959 and the Mills Weekly in 1985, before settling on the current name as the The Campanil in 2007. Sarah Pollock, the current Campanil faculty advisor, details how the production process has changed over the course of her quarter of a lifetime reign as an advisor. She remembers the journalism process before computers and digital platforms. Today, the physical newspaper is designed mostly on computer programs and publishes bi-weekly to allow for more online content. Although The Campanil is funded by ASMC and has a faculty advisor, it is an independent, student-run newspaper that represents the Mills students’ voice.